If you know me, or you’ve been reading my blog for a while now, you’ll know I can’t live without my eyeliner. Okay, that might be a little bit of an exaggeration but I just love eyeliner to the point that I feel like no makeup look for me is complete without it. Plus, my eyes are deep set, so lining my eyes really helps to define them a little better. Alright, enough babbling. Time for a review! An eyeliner review, of course. This was another cute little product I picked up when I was in Japan, specifically while wandering down the famous Harajuku street. It’s the CREER BEAUTE Love Darling Eyeliner. Does the character on the packaging look familiar? If you watched a bunch of 80s anime like I did as a child, it’s Lum Invader herself from the anime/manga series, “Urusei Yatsura”! I love any designs that feature old-school anime protagonists like Lum Invader, Sailor Moon, or Creamy Mami. They’re always just so cute! Product info: Creeer Beaute Love Darling Liquid Eyeliner Brown is a waterproof, smudge-proof and sweat-proof liquid eyeliner. It’s only 0.1mm for the pen. 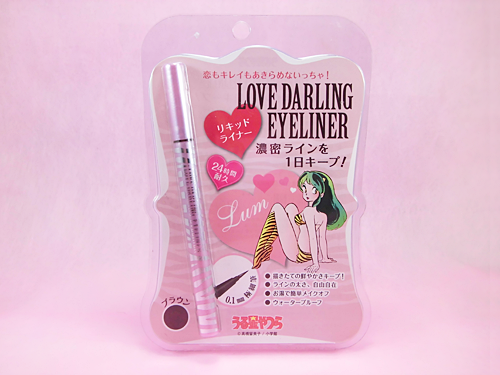 The eyeliner housing itself sadly doesn’t feature Lum anymore, but it’s still cute nonetheless! It has the signature tiger stripes of her outfit, but in pink and silver. The pink parts have a somewhat frosty finish, while the silver parts are metallic. Like in the product description, the tip of the pen is only 0.1mm so it’s very fine. The finer, the better for me when it comes to eyeliner so I can create very precise lines and points, especially when it comes to winging out my cat eye. 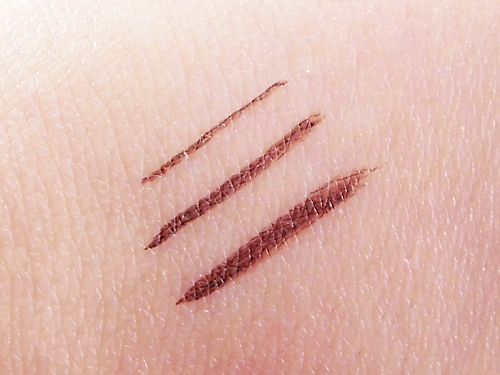 The CREER BEAUTE Love Darling Eyeliner comes in two shades, brown and black. I already have a lot of black liquid liners, so naturally I decided I should collect more brown ones. 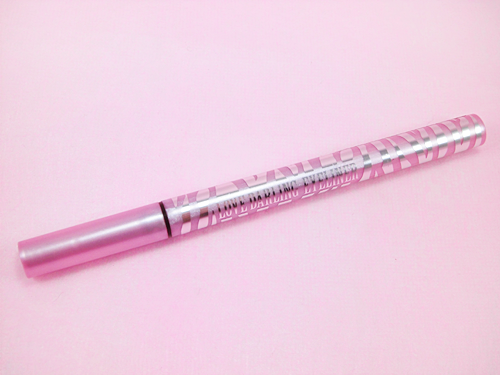 The eyeliner’s formula is dry to touch in just seconds, so I can immediately move onto curling my lashes for mascara after applying this if I want. It’s not super opaque when you first apply it, but just another ‘coat’ makes it bold and opaque enough already. I’m pretty sure the black shade comes out a lot more opaque, from what I’ve seen with other reviews anyway, but I find that’s the case for most felt-tip liquid liners. Black formulas just tend to be more pigmented. When dry, it is indeed smudge-proof, but not entirely. 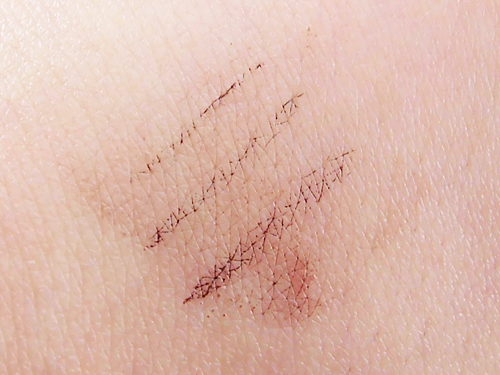 After rubbing it lightly, it already begins to fade a little. It eventually disappears completely, but only after I rubbed it multiple times so unless you’re constantly rubbing your eyes then I think that’s still pretty good! Again, those with the black eyeliner say this is completely smudge-proof for them so I’m convinced now that the black one also has a ‘stronger’ formula overall. When wet, and if untouched, the eyeliner doesn’t budge. But water weakens the formula so it can easily come off then. With just one swipe of your finger, in fact. The same happens with oil, so if you have oily lids like me, just remember to use a good eye primer beforehand. Once more for comparison, I’ve read that the black eyeliner can survive even after being rubbed while wet, as long the water wasn’t hot. The curse of non-black eyeliners strikes again! Still, I’m very conscious of my eyes when I know I have eyeliner on and I only really touch my eye area when I need to apply eye drops, put on my contacts, or can’t bear an itch any longer and have to scratch or rub a little there. Safe to say I sometimes do end up rubbing away a bit of the eyeliner, particularly the wing part or the inner corner of my eye. Oh well! Thanks to the fine point of the liner, it makes it perfect, as well as super easy, for me to do my everyday cat eye look like I did here. You can fill in any gaps, especially between the lashes, without trouble too. So despite everything, I still have to say I’m quite impressed with this liner because it managed to survive one time when I went to a concert on a super hot day and ended up really sweaty and gross. 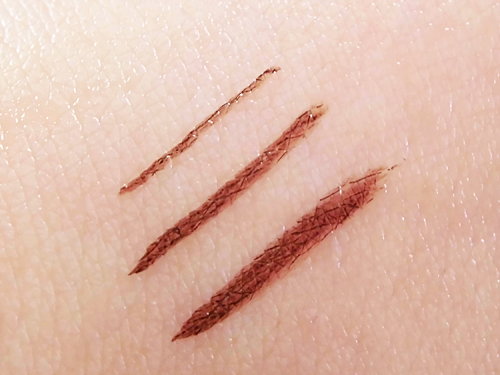 The liner did crease and fade on the areas of my eye in particular where the skin folds, since those areas move and rub together every time I blink, but that’s almost always the case for me even with other liners, and even if I’ve used a primer. When my eye is open you can’t see the parts where it’s disappeared anyway. A quick and careful touch up is all that’s needed for it! Other than that, my liner still looked almost perfectly intact! Take note, I didn’t use an eye primer on that day too. 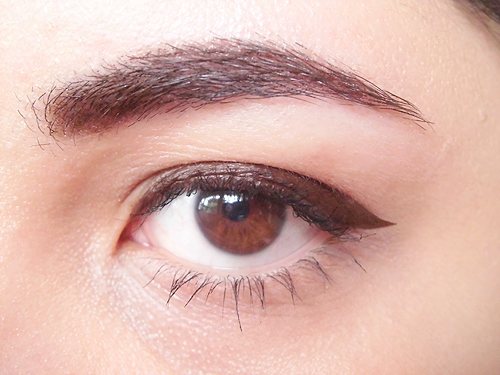 Another aspect that impresses me so far is how the tip of the liner isn’t drying up yet. Yet! Just pointing this out because I found that a lot of liquid liner pens I’ve owned had tips which dried up pretty quickly over time and made using them such a pain. I’d constantly need to go over lines I’ve already done because it just wasn’t applying evenly, if at all. Don’t even get me started on how impossible it was to create even and perfect wings! 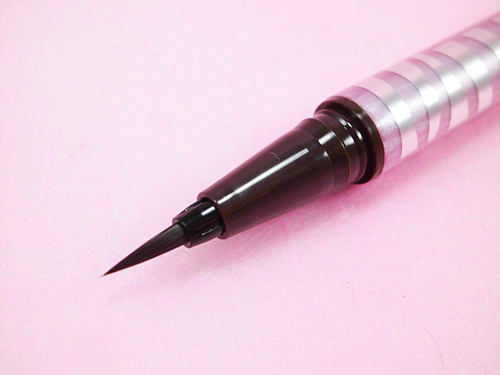 My Dolly Wink eyeliner pen, which I got the same time as this, is already beginning to dry up badly. I just hope I’ll be able to continue using this eyeliner without the same thing happening until it’s completely used up! Very fine and precise tip. Can be easily removed with a makeup wipe or liquid makeup remover. Water and oil weakens the formula. The black counterpart seems to have an overall stronger and more pigmented or opaque formula.